Displacement | Southwark Notes - whose regeneration? 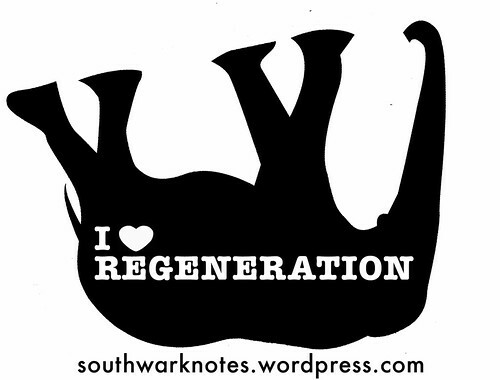 Southwark Notes – whose regeneration? Seeing as the whole sorry tale of Southwark Council’s 20 year ‘regeneration’ of Elmington Estate is very long, we thought we would make it easier by summarising the most dastardly points in the above picture. Diehards can read the full 6000 words in a separate post here or print out it out as a PDF here. It is worth reading our fully illustrated nuts and bolts telling of the story all the way through as it shows, in detail, once again how long-term regeneration projects premised on demolition are really social cleansing schemes. The decant and re-housing processes are unjust and the Compulsory Purchase Order of leaseholders homes are legally punishing where no crime or wrong doing has been committed by those who were living on Elmington. The telling of this story is also interesting in that it’s told almost 100% from the Council’s own consultation and progress documents. If the Council’s own telling of their regeneration scheme shows how appalling it is, it’s saying a lot, no? Yet in the same documents they also insist that everything is good and dandy for all! 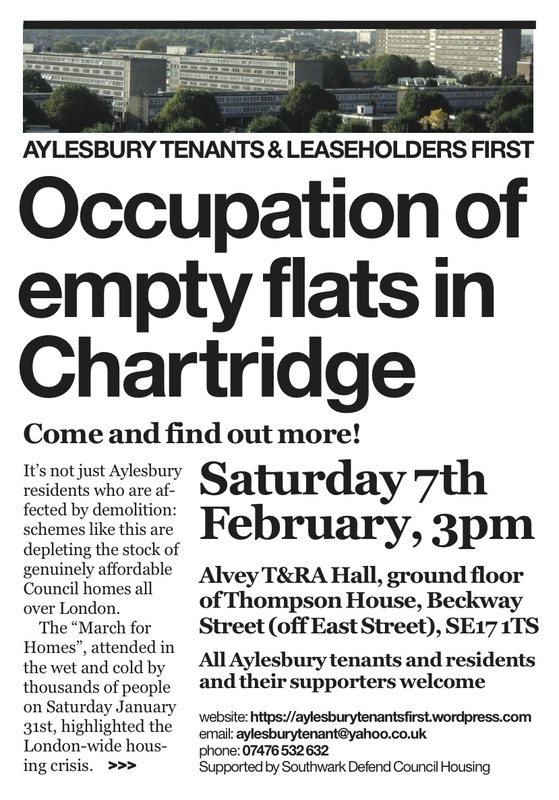 What’s clear once more, just like on Heygate and Aylesbury Estate, is that such ‘regenerations’ always result in a net loss of much needed local council housing – here 346 homes! They always result in the chucking out from the immediate area of long-term council tenants even though the ‘regeneration’ is supposed to benefit precisely them. Time and time again we see that such ‘regenerations’ always have long histories of tenants saying repeatedly in protests and meetings with the Council, ‘we want to stay in the local area as council tenants‘. They always receive promises that this will be the case but these are always broken somewhere down the line by the Council despite mealy mouthed public assurances that ‘regeneration’ will benefit all – local communities and incoming private buyers. This is never the case. We have to start viewing regeneration as premised on lies. Regeneration is a big lie and the schemes are impossible to deliver without lies. This has been our experience every time. This is crucial for any new campaign against ‘regeneration’ to grasp at the very beginning. Nearly As Good As Sherlock Holmes! The Elmington story is, as yet, little known which is why we’ve spent a long time piecing it together. It starts all rosy with new Council homes built in Phase 1 but by Phase Two and Three, ‘regeneration’ simply means demolition of council housing and any replacement social housing delivered being unaffordable – shared ownership or ‘affordable rent’. The Council on the hand publicly attacks ‘affordable rent’ (rents up to 80% of local private rents) but on the other hand allows Notting Hill Housing Trust to build ‘affordable rent’ homes as the policy compliant ‘affordable homes’ component of Phase Two. Such demolition then means a displacement of tenants to other parts of the Borough and the displacement of leaseholders through both low valuations and a vicious Compulsory Purchase process. In the long years since the ‘regeneration’ started, the fact that hundreds of council homes were demolished is brushed under the carpet as the Council reneges or fails to provide a Right of Return for many of the households who signed up to the ‘regeneration’ on the premise of a new Council Homes on site. Despite the staggering initial loss of 369 council homes, the Council ten years later describes the empty land as a ‘brownfield site‘ and hence ripe for flogging off to developers. Those former homes are now magically absent as if they never existed, those tenants moved off to somewhere and non-existent too. Although our long study of the highly dubious Elmington ‘regeneration’ sadly does not read as good as Sherlock Homes, there is something of a whodunnit about it. This is why we love to highlight once again this quote from Richard Livingstone, the (then) Southwark Cabinet Member for Housing in April 2015: ‘It is also worth noting that for every estate regeneration that has started since Labour took back control of the council (so this excludes Aylesbury and Heygate where the process started pre-2010) we have either retained the current stock or plan to increase the number of council homes’. This he said as the Phase Three Elmington demolitions and resulting loss of council homes were just about to start. Whodunnit indeed? In an exchange on November 22 2016 with Leader of the Council Peter John about the current demolition of council homes, we were surprised as ever by his claims. After, we pointed out that 144 homes were being demolished on Elmington and that no council homes were part of the scheme to re-house those displaced, his answer was the usual ill-informed one: ‘Council tenants prioritised for re-housing in better accommodation. New social housing delivered at Elmington’. We then pointed out that if less non-council social rented homes were built for rehousing folks then it wasn’t much of a priority. If 113 council homes are demolished and only 62 social rented homes are built, that’s a little bit less than 55% replacement. So where is the right of return to the area they agreed to leave for the other 45% of the community? The discussion went cold when we pointed out these facts and asked where people would go. Peter John said he ‘didn’t know and will look into it’. Five months later, we are still waiting for an answer. Whodunnit Peter? Magnifying glass is in the post to you! ‘In Monday’s article (regarding the secretary of state allowing Aylesbury Estate residents the right to remain in their homes in the face of Southwark Council’s and Notting Hill Housing Trust’s socially unjust ‘regeneration’ scheme) important points were missed. The Secretary of State for Communities and Local Government Sajid Javid’s rejection of the compulsory purchase order should shame Southwark. Aylesbury Estate has a large Black and Minority Ethnic population. Javid’s report was clear that the redevelopment scheme will affect these most vulnerable local residents and noted Southwark’s failure to uphold its public sector Equality Duty in this respect. The article also gave the impression that the leaseholders involved in this case are the last ones left on the estate. In fact, this recent Public Inquiry only relates to the “First Development Site”, a small part of the 60 acre estate. There are still hundreds of residents in the rest of the Aylesbury, watching this case with great interest because their homes are due to be affected by Phases 2, 3 and 4. The scheme if it goes ahead will result in a minimum net loss of 800 affordable council homes further impacting available housing for locals on the housing waiting list. 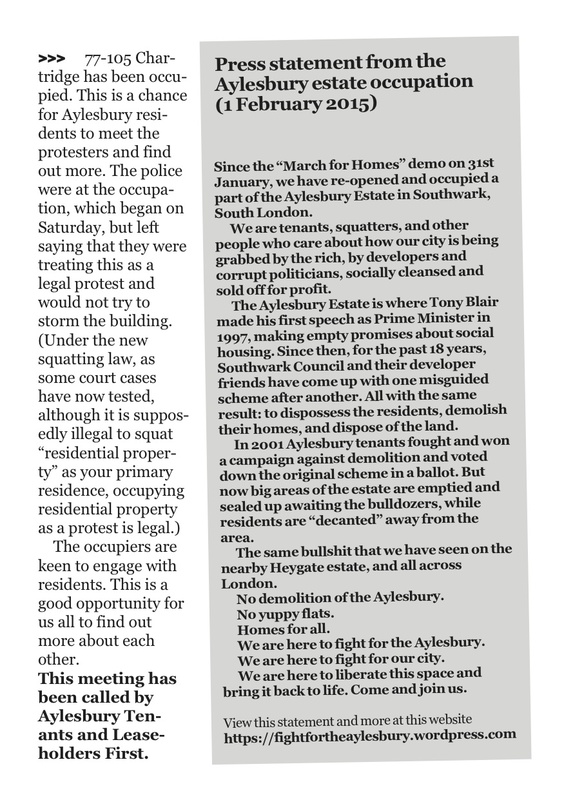 After Heygate Estate’s demolition and replacement by mostly private sale homes, residents are fearful of Aylesbury becoming another Heygate, campaign groups in Southwark are calling for a moratorium on estate regeneration schemes that are premised on demolition and decanting of residents. Finally, the statement by Southwark’s head of regeneration states that the regeneration is “supported by the vast majority of residents”. This is not true – the only ballot of residents to date (in 2001) rejected redevelopment with a 73% majority on a 76% turnout. Southwark Council and Notting Hill Housing Trust must now rethink this entire regeneration model and listen to the residents’ needs and desires’. This is a Whodunnit written in advance of a murder. It’s a very serious life and death affair. Anyone who visits and uses the Elephant & Castle Shopping Centre, as we have been doing for over 25 years, knows that it’s exactly what it is. It’s exactly what it says on the tin – a Shopping Centre. It has about 80 businesses that go from the big Tescos and Smiths to the smaller shops like hairdressers and food places to the smaller kiosks for all sort of the things – clothes mending, coffee, handbags and so on. In what is really the moat of the Castle, for the Shopping Centre was built like a castle, there is the popular small market of numerous and varied cheap stalls. Mostly the shops and services are independent and often family-owned businesses where the owners live locally. The Shopping Centre is more than just a series of shops though. Any day of the week sees people meeting friends there, hanging out, chatting in the cafes, loitering, keeping warm, watching the day go by or whatever people want to do there socially within reason. Although we can buy dog food, bags of nails or bibles (if you want), we also go there to catch up with what’s happening, with who is there, with what funny things are going on, with all the long-formed non-shopping things that people do under the Centre’s roofs. It’s a place that contains all the great funny stuff that local people bring to it, both funny ha-ha (the banter between people and shopkeepers) and the funny peculiar (like the guy stuck inside the service tunnels somehow before the subways were shut!). This is what makes the place human and simple. It’s the very heart of The Elephant and a poke in the eye to recent claims by developers ‘The Elephant & Castle has no soul..there is no community here’ (as Rob Deck, former Lend Lease Project Director of The Elephant regeneration told us all once). We aren’t out here to tell tales of simple folks doing simple things as this is just patronising rubbish and there are plenty of people already painting this picture. The Shopping Centre is as complex as all the people’s lives are who use it: stressed, joyful, skint, getting by, on their uppers, begging, coping, living large, whatever and it’s within those complexities that lies the Elephant’s care of its community. But we have to say it’s a cheap and cheerful place with no apology required. It’s not a fancy place. It’s not an expensive place unless you need a wee. It’s not a place for coming to for a Next or H&M or Wagamama or Giraffe or EE or Waitrose. To return to our serious affair, we know that once this central heart of The Elephant is gone and replaced by 1000’s of expensive flats and mostly chain stores and restaurants, there will be very serious consequences for local people. This is the murder in its planning stages. This is the premeditated death of the Elephant community. Some people like to talk about how there is no such thing as ‘community’ but we tend to think those people don’t know because they either have never lived in one or they do but don’t know how to be in it. Community, such as The Elephant area, is always more like a community of different overlapping communities who mostly get along but it’s a recognisable physical, emotional and economic mish-mash of all of us. The Shopping Centre is a kind of second home for many in those communities. It’s a place to go where you feel safe, there’s a familiarity, there’s a stability in visiting and a purpose, be that your dogfood or bibles, or sitting shooting the breeze seeing what’s up. It can be and is for many a place of direct social contact with traders you know, friends or strangers. It’s the breaking for many of the everyday isolation. It’s a vital connection for many but particularly older folks. It can be a place of sharing, of trust and of generosity in even the smallest encounter. Contained in all these moments and interactions is a sense of well-being and the positive affect this brings to people’s healthiness. What helps these feelings and meanings flow is that it’s a big place with places for sitting and its sheltered and it’s central. It’s the Shopping Centre, the centre being the Heart. The plans to demolish the Shopping Centre as part of the by-now infamous ‘regeneration’ of the Elephant area go back donkey’s years. By February 2004, Southwark Council had adopted a Supplementary Planning Guidance called ‘A development framework for the Elephant & Castle’ that proposed demolishing the Shopping Centre and the Heygate Estate. The vision they dreamed up was a new ‘town centre’ with new homes and new leisure and shopping facilities based around a network of new streets at Elephant and top of Walworth Rd instead of a centrally-located Shopping Centre. More plans and negotiations with the owner of the time St Modwen went nowhere past the envisaged removal of the shops ‘between June 2008 and June 2009 with demolition in early 2010’. There was always a big tension in the fact that the larger regeneration plans were hampered by the Council not being the owners of the Shopping Centre site. The Council could agree with Lend Lease to demolish the Heygate but had little real say in the Shopping Centre. Then there was a funny moment when St Modwen and the Council seemed to suddenly agree to a ‘in-principle decision’ to not knock it down (as had been planned since 2002) but to refurbish the Centre and bung loads of new private homes on top. In the end, the Council were unhappy with St Modwen’s homes idea and refused to consider more than 500 units on site. St Modwen claimed this would not be ‘financially-viable’ of course but having also been playing a long and difficult game of speculation by holding on to the site for as long as possible finally sold to Delancey in 2013 for £80 million. St Modwen had bought the site of UK Land in June 2002 for £29 million anyow so ker-ching! Delancey is major property company owned by Jamie Ritblat (see photo of one of his modest houses above) . You can Google that name to revel in his tax-dodging and avoidance of paying millions in stamp duty. Delancey is a British company registered in tax haven the British Virgin Islands (23,000 residents, 1,000,000 shell companies registered there!). Delancey’s ‘principal client fund DV4’ is the owner of the ever name-changing new development on Elephant Rd where three large ugly towers have gone up recently adjacent to the Shopping Centre. Here we are talking serious money and serious investment and serious land values. In late 2013 Delancey and APG, the Dutch ‘pension fund asset manager’, formed a new ‘Joint Venture’ to deliver 3000+ new homes in London particularly at the ex-Athletes Village site post-Olympics in East London. Their other main development is the new retail and homes at the Shopping Centre. In 2016 there was a £1.4 billion merger between Qatari Diar Real Estate Investment Company, Delancey’s client fund DV4 and the Dutch pension fund asset manager, APG. Qatari Diar is a real estate company established by the Qatar Investment Authority in 2005, itself a ‘sovereign wealth fund’ owned by the state of Qatar, a country with a dubious record of workers rights amongst other things. APG is a €343bn Dutch pension fund asset manager owned by ABP, a public sector pension fund for people working in the Dutch government and education sectors. ABP slogan is ‘Tomorrow is today’ but we’ve known for ages that ‘Tomorrow is actually tomorrow’. Anyhow, because they are only thinking about you, Sheikh Jassim Al-Thani, chief development officer for Europe and the Americas at Qatari Diar, says that they have a ‘vision to create vibrant, sustainable local communities where people aspire to live, work and visit’. You could be forgiven for thinking that paying into your pension fund was really about you having a few quid after you retire rather than the money being ending up being used by an international cluster of disreputable friggin’ sharks to make money from the gentrification and displacement of locals and local businesses wherever they happen to have their eyes on. The financing is as global as the resulting displacement – London, Sydney, Mumbai, Rio de Janeiro, Luanda etc – and that’s how the system works! Money circulates internationally in ever fewer hands looking to land and make a profit. Any statements about making ‘new great places to live for everyone’ is pure guff. The bottom line is profits. The Elephant is just one more example of how regeneration is just the making of money dressed up as an urban planning matter. To put it another way – they don’t care about you! DO YOU WANT SOME OF THIS? Interestingly, although these companies don’t give a toss they do go along with the game of pretending they care about what we think. In a monumental time-leap from 2000 to now we are still subjected to what they call ‘consultation’ but we have come to call ‘pantomime’. It’s worth thinking through how any of these plans to destroy the community are supposedly validated by the community. In the early 2000’s, the Council conducted a ‘consultation’ at The Elephant about their plans to demolish it and replace it with a Town Centre. It’s published results were somewhat skewed. Of 464 responses to their viewing of the new plans, 80% of replies were either ‘strongly or moderately in favour’. Hence we calculate from an area containing 1000’s of local people, 371 were either dead keen on the plans or were ‘moderately’ in favour i.e their agreement was actually quite limited. From this consultation, the Council begins to trumpet a mandate for demolition from local people. If we jump to Delancey’s public consultation in July 2015 when the first few details of the proposed plans are shown, we can see how such ‘consultation’ (asking for people’s input) is skewed by the misleading and bogus questions people are asked. There is no point going over old ground again and so you can read our critical responses to those questions here! Worth pointing out that at no point does this question – Would you like the development to include homes for people who love and live in London? – ask about what kind of homes are they talking about? Why are there no questions about types of tenure so that people answering the questionnaire can specify types if tenure they desire locally. People could then also talk about the absent question of social rented and affordable housing in the scheme. 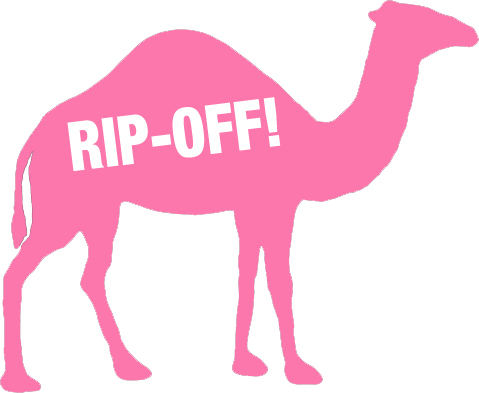 As part of the ‘regeneration’ of the area, the Elephant & Castle zone has been awarded the dubious status of being an ‘opportunity area’ which we read as being an area ripe for the picking for opportunist investors, developers and more international shitehawks. Such an ‘opportunity’ means that the area is set for a ‘minimum of 4000 new homes to be built by 2031‘. This also supposedly includes at least 1,400 ‘affordable’ homes although few truly affordable social rented homes are being built or even if they are promised through the contract of S106 provision, they are being switched to unaffordable rents at the last moment. These are the same ‘affordable rents’ that the Council says ‘we do not think that the new affordable rent tenure is affordable for people in housing need in Southwark’. What is becoming increasingly clear is Delancey’s plans to maximise the number of private homes across the whole Shopping Centre site and what will be the former site of the London College of Communications over the road by building 650 homes. (You’ll remember from earlier that St Modwen sold up after being refused only 500 homes!!) The LCC deal means that’s acres of prime land where the college now sits will be the landing place for numerous tall towers (19 to 31 storeys) adjacent to the other tall towers (20 to 31 storeys) planned for the Shopping Centre land themselves adjacent to Strata tower, the One The Elephant tower and the 44 storey tower at Newington Butts. We wonder if any daylight will reach us mortal at ground level? For us, the question remains: who is this new housing for? Already we know that it will be entirely made up of towers of ‘built to let’ properties. This is a new fast growing housing sector that means developments are only made up of new private rental properties. None of the flats are for private sale, or for shared ownership and none are socially rented or ‘affordable’ rented (rents up to 80% of local private rents). Instead they are all owned by the developer and rented out to people for a maximum of three years. When Delancey’s Stafford Lancaster was asked by Council members what guarantee Delancey would give as to the level of social rented housing in the development, he ‘stressed again that these were very early days’ and said ‘that as the rental model was a mass-market product rent levels would need to reflect this. No firm commitment or comment was possible at this stage but there would be a robust discussion about the viability assessment’. This is simple code for no cheap housing as they are allegedly a drain on profits. Back in the real world of property and profits, Realstar, a large Canadian developer of the private rental market, is offering studio flats at their Courland Grove tower in Stockwell for £246 per week! What rents will Delancey be offering at The Elephant? We shudder to think. If we are to think of the number of times promises have not been seen through by the Council and developers, we shudder to think again, of the fate of the independent shops, kiosks and market stalls who make their living in and around the Shopping Centre. There has been a great campaign being run by Latin Elephant that raises the question of how to protect the strong local Latino businesses and culture that has been around the Shopping Centre for over two decades now. At the end of the day, of course, everyone is in it together and all the businesses there have to come together to fight for the rights and against being shafted. For many of the Latino businesses outside of the Shopping Centre redevelopment, being mostly in the railways arches, they will have to face the aggression of Network Rail who have a disregarding flair for kicking out their tenants once an area is ‘up and coming’. Network Rail’s vision is for more Nandos and more high fee gyms and not necessarily the often precarious tiny business created inside mini-malls in the arches. But inside and around the Shopping Centre are numerous small businesses that will have no place in the new retail zones to be built. There will be some provision for ‘affordable retail’ built into the plans with phased rent-free periods and discounted rents but the few that have been built locally have been tiny and unsuitable for much (see the minuscule unit set aside for Shopping Centre traders that’s in Dashwood Studios student building 120-38 Walworth Rd). Such ‘affordable retail’ units will be set out in developers Section 106 contracts but we’ve been seeing that increasingly such S106 agreements are being weaselled out of. Delancey’s Elephant Rd development is still supposed to have a market square in situ but we doubt this will be for the kind of popular market stalls the Elephant currently has. Delancey has also used their provision of this market square as an ‘exceptional circumstance’ for why it could not possibly include any affordable homes in their development. Delancey has also been making dubious movements on its promises of affordable retail in its development (see ‘Delancey – a morality tale’ in this post from 35% Campaign). It has also lined the Council up to use its Compulsory Purchase powers for traders who are unable to agree a compensation level for their business move or closure. None of us here at Southwark Notes Towers can remember a time when traders at the Elephant were happy with the regeneration plans. The most common complaints have always been that traders had no idea what was going on, felt that the Council weren’t talking to them and that they would not survive any regeneration of the Elephant area. By 2007, things were so bad that the traders managed to present a Traders Charter to the Council detailing their concerns: ‘As small business traders at the Elephant and Castle we feel that the regeneration of the Elephant and Castle, approved in 2004, has significantly disadvantaged us, by damaging our existing business livelihoods and future prospects. We have suffered a slow and progressive cloud of regeneration induced recession with the prospect of extinction. Our businesses have suffered over the past four years, with little hope of any improvement. During this time many small businesses have folded, through being driven out of business by the regeneration’. The demolition of the Heygate and the displacement of those residents resulted in a drop in trade for many of the local businesses. Jump ahead with us once more to 2014 and the ‘Trading Places: Research at The Elephant & Castle Shopping Centre‘ report from consultants Social Life found traders still saying ‘it will kill my business’ or ‘I will lose everything’. Traders told Social Life’s researcher that they fear rent rises, displacement, closure and lack of compensation and the majority said they were not being talked to by the Council. Many traders also affirmed the social role they and the centre plays in people’s everyday lives saying ‘It’s not just about shops, it’s community, saying Hello’ and ‘We look out for our customers. Some of them come at special times or on certain days so if they are not they I ask about them’. The following story does not add much conviction to Delancey’s commitment to traders in the Shopping Centre. Paulette Simpson of the Jamaica National Building Society spoke at a meeting of the Council where Delancey were present on behalf of businesses from the Caribbean community. She said that the community was concerned at the lack of consultation, the provision for displaced businesses, whether businesses would be able to afford to return to the new shopping centre and how long the development would take. What profile of businesses was Delancey was envisaging, including size and rents, and what reassurances were there that current businesses would not be driven out. Stafford Lancaster from Delancey stressed that consultation was at a very early stage and that he looked forward to engaging with all businesses. At the recent launch of Latin Elephant’s ‘The Case for London’s Latin Quarter: Retention, Growth and Sustainability’ on 6th June 2016, Mark Williams Cabinet Member for Regeneration & New Homes said the Council will “shout it to the rooftops” that E&C is London’s Latin American quarter and that the Council will “fully support” the report on protecting and enhancing The Elephant’s Latin Quarter. 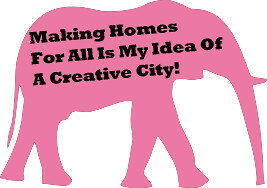 It’s a tricky situation for us overly pessimistic types and we don’t want to pour any cold water on the amazing work of Latin Elephant in engaging with the Council and others to ‘voicing the concerns of Latin Americans in the Elephant’ but we wonder what real guarantees the Council can give traders that they will be benefiting from the ‘regeneration’ and not being thrown out of the area. It’s simply not possible for all the little businesses to survive regeneration which then beggars the question of how and who does regeneration really benefit? It’s also tricky because over years we’ve simply ended up believing that the Council cannot be trusted and between us and numerous other local blogs there is not a week goes by when another shoddy and scandalous revelation is laid at the Council’s door. BUT we support 100% Latin Elephant’s engagement with Southwark and it’s organising around protecting the Latin American community. It’s vital work. IT’S NOT LIKE THE COUNCIL DON’T KNOW WHAT THEY ARE DOING! 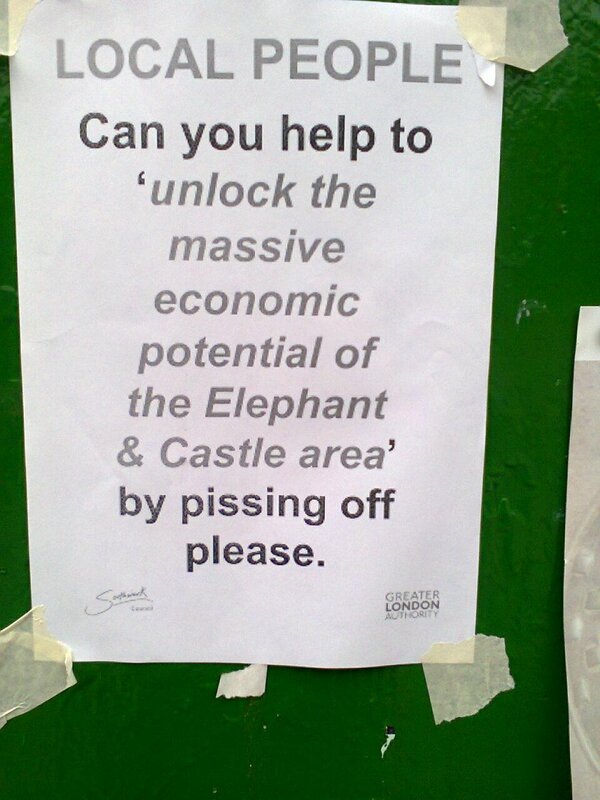 Interestingly, until forced by statutory requirements of the Equalities Act (2010), no assessment of the effects of regeneration on the area’s more marginal, vulnerable or precarious people had been carried out despite the numerous policy plans that were produced both Borough-wide and for The Elephant. The first Equalities Impact Assessment (EqIA) was undertaken for Southwark’s 2011 Core Strategy document that provides a ‘local development framework’ for the borough. It’s worth looking in detail at the EqIA for the Shopping Centre and Walworth Rd area and the Council’s own noting that East Walworth ward still ranks in the 10% most deprived areas in the country and that parts of Faraday and Newington wards rank in the 20% most deprived areas in the country. It’s a long document but we can summarise quickly by simple quotation the main thorny question of ‘regenerating’ The Elephant. The report says ‘The plan could unintentionally fail to meet local housing needs by not providing the right housing type and mix for the local community which could sustain or result in overcrowding and poor quality accommodation which in turn disproportionately affects older people, young and Black & Minority Ethnic community’. Following on from this insight, the report continues that ‘The regeneration of Elephant and Castle may result in a rise in house prices and housing may become unaffordable to those currently living in the area, especially for, lone parents, disabled people, the BME community and elderly people. This may also result in a dilution of the community as people are forced to move out of the area as they no longer can afford to live there’. Is this the only ever common sense to be found in Council thinking and experience of the real community-smashing effects of regeneration schemes? What does Heygate show about displacement and replacement of council homes with unaffordable Housing Association rentals? It then beggars belief when right after the above two lines the Council can assert that ‘redevelopment and regeneration of areas may result in the disruption of communities’ and that ‘as part of the Elephant and Castle SPD we will look at how we can successfully create mixed communities with a range of housing types and tenures. This should help to improve social cohesion’. The Council’s EqIA’s solution to the problem of ‘social cohesion’ is to ‘mitigate’ displacement by building 4000 unaffordable homes and destroy the local community business base at The Elephant. We’ve long been critical of the use of the term ‘regeneration’ to signify much that’s positive for local people. It sits alongside the Council’s use of the term ‘revitalise’ for places like The Elephant, Peckham, Old Kent Rd etc. Do they really mean that they will ‘give new life’ to these places where we live? What on Earth do they mean when these places are already full of life. We know they already think we are the ‘wrong sort of residents’. Do they know think we are the wrong sort of lives too? When we were thinking about the title of this writing, we thought about how some of those displaced from their homes on the Heygate suffered terrible ill health from stress and anxiety at being removed from the deep social bonds they had created and maintained for years and years. We thought of how some people had died prematurely from the awful experience of decant and displacement. We also thought how the Council had no monitoring in place to keep in touch and be aware of the circumstances of those who it moved at of their area just so they could see if people’s lives, health, employment, happiness and so on was improved or denigrated from being moved off the Heygate. Is this going to be the same for 1000’s of Aylesbury Estate residents too as they get the heavy hand of ‘good for you’ regeneration? When we say that The Elephant is being murdered we refer to the area and to the killing of a long-term home-grown neighbourhood with special characteristics, peculiarities, strengths and weaknesses. When we say murder though we also mean it very specifically in that regeneration in this cynical fashion that seeks to replace deep bonds of community togetherness (with all its problems too!) with an alienating and sterile landscape of chain shops and pseudo-public places will result in a few local deaths from the removal of the heart of the area and the familiarities and connections it brings. Such community networks, developed and grown over years, provide people with support from neighbours in addition to, or instead of, the help from family. These informal support networks give people a level of emotional resilience derived from the sense of safety and well-being that comes from knowing and trusting people in the immediate locality. But the Council or Delancey won’t ever be consulting us on loneliness, or stress, or depression or isolation. For them the plans are all shiny wonders of progress that we should all be in awe of. For us these plans are deadly! Southwark Notes attention has been drawn by our international circle of art-loving friends to an article in Art Monthly, October 2014, entitled ‘Public Art Attack’ by writer and curator Andrew Hunt (here). The article writes in depth about the cancelled Pyramid for Heygate public artwork that we opposed and wrote about at length at the time. 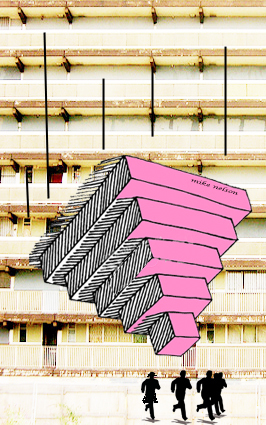 The article, amidst a heap of other artworks and references, makes a case that the dumping of the Pyramid through Council jitters from local hostility was a bad thing because the Pyramid as a symbol of top down ‘brutality’ would have been a perfect opportunity for ‘dialogue’ around processes of social cleansing. As for ‘gagging’ ourselves – local campaigns existed well before the proposed Pyramid and they still exist after. They did not need the blessing or supposed intervention from the art world to make their arguments public and accessible. 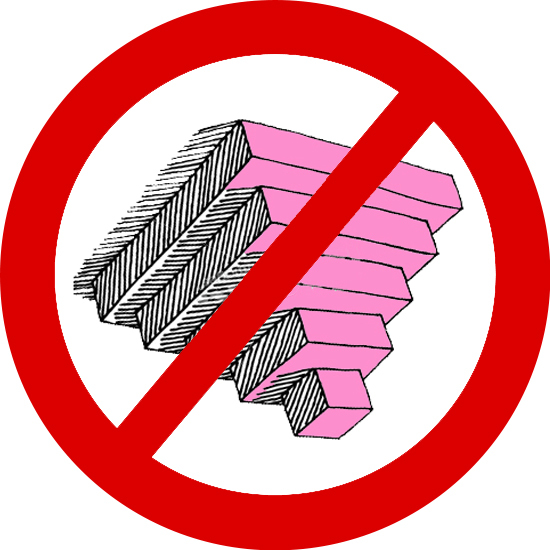 In fact the protests around the Pyramid and its cancellation was part and parcel of the continuing making known of what was happening around Heygate Estate and North Southwark and found many sympathetic ears in others local campaigns. Mike Nelson was never attacked directly because without access to Mike Nelson as the writer seems to have had, it was always impossible to judge the artists intentions at the time. When the Pyramid was going through the motions of being prepared for the Heygate site, there were no public statements from Mike Nelson on his intentions such as those now retrospectively revealed by this article. It is also somewhat hard to trust these revelations of a pointedly critical work against Southwark Council’s treatment of Heygate residents, when Artangel and Nelson had been looking for a site for such a demolition and re-construction since 2009. This in some ways undercuts the argument then made around Heygate being chosen as an artistic target. It is somewhat fanciful to imagine that Nelson was trying to pull the wool over Southwark’s misty eyes with his assertion that ‘an artwork was needed that represented the same form of brutality’. Artangel might produce monumental artworks by artists but it does not seem to have a long history of going in for projects that would be such an attack (on Southwark Council in this instance) as the one Nelson desires. Anyhow we would be interested to know where this Nelson quote comes from and when. There is no source for the quote in the article. The Art Monthly article attempts then a somewhat revisionist version of what local opponents were saying at the time in a way that attempts (once again) to re-establish the primacy of art as a neutral space for ‘dialogue’. For us, as vocal and public critics of the intended public artwork, we still think that focusing now on the artists intentions are missing the point. We were clear at the time that our criticisms were more levelled at both Artangel and The Council and much less at Mike Nelson precisely because we were unable to judge what he had in mind with this Pyramid. Also worth saying we appreciated that the piece was not a ‘socially engaged work’ (as modern descriptions have it of creative projects done with usually disadvantaged communities or folks and all the ‘orrible discontents liable to surface in such artistic engagements). The Pyramid remains committed to the older form of The artist makes Artwork and the rest is up to us. Either way, we find both forms inherently problematic and full of unpleasant contradictions that ‘Art’ is unable to either resolve or improve. Maybe we can simply restate again our arguments and the feelings of some local residents including some of those who were displaced by the Heygate regeneration. – Like the Council’s own imposition on Heygate residents of the regeneration scheme and it’s non-accountable resultant loss of 1000 public housing homes in favour of 1000’s of new private homes, the Artangel Pyramid also seemed a done deal foisted upon the remaining community. There was little attempt to ask local people and those who had been displaced what they thought about the art project. At Southwark Notes we offered numerous times to put Artangel in touch with local people and campaign groups so they could sound out local feeling. They ignored these offers in favour of later asking us for community contacts for engagement around the Pyramid only after it was built. Artangel also entered into contracts for demolition, had access to the Heygate site and spent much time figuring out how the Pyramid would be built and so on even before their planning application has been up for decision. This seems to point to us that the Council had already reassured them that all would be fine. Our initial letter to Artangel makes our point clearly that this kind of behaviour is made on the basis of the power of privilege that exists for middle class art curators but not for Heygate residents to decide (once again) what happens to where you live and your community. Some of those who had been ‘decanted’ just did not want this art to be allowed to arrive at the site and all the insensitivity this implied. – We made a concerted effort to criticise the Council and it’s desire for a triumphalist artwork on the Heygate site precisely because they wanted such a cultural capital-rich artwork to be instrumental in heralding the regeneration project. Being unable to ‘decipher’ much about any of the supposed artists intentions, they were happy to go along with it, whatever it was, alongside as it made headlines for them, as ‘Southwark’, for their regeneration project. It was only when local people made a fuss and promised a heated reception to the Pyramid that they then saw what an abyss of negative publicity opening up before their very beautiful regeneration scheme. Despite chummy assurances and helping Artangel prepare the site and scheme, they freaked out on Dec 20th 2013 and pulled the plug leaving Artangel in the lurch and (as we understand it from F.O.I requests) contractually obliged to the demolition company who they had hired to do the preliminary deconstruction work on Cuddington block. – It is clear to us from occasional conversations we find ourselves involved in that the idea that Pyramid would create a space, as Hunt says, ‘to reflect urgent political decisions and to engage in favourable dialogue with campaigners concerns’ still has some currency despite the campaign against the Pyramid and the very arguments on which it was resisted. Without an agreement or sensitivity to those locally who are the community about whether they want this artwork, bringing thousands of people to come into that community to see the Pyramid is disrespectful and also loaded with fantasies about how that audience will engage in this struggle not to be displaced from our homes. Art lovers or the curious might imagine they are entering into a dialogue or polemic about regeneration but, we suspect, that they are more likely to have an interesting day out at a site of social cleansing that is now only open to them as an artwork. 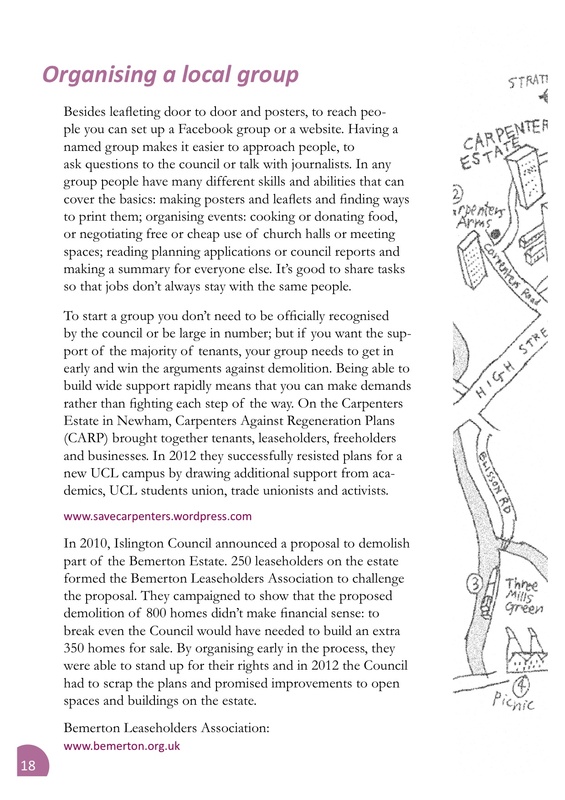 For local campaigns who have spent years having their own public meetings, writing publications and websites, holding protests, anti-gentrification walks around the area and so on, there was little interest in having a Pyramid help them out especially one foisted upon them with zero attempts by the artist or Artangel to contact them beforehand. For us, we remain committed to believing that such a public spectacle around the construction of a Pyramid out of one of the old Heygate housing blocks is of dubious use for any real actual political fighting against ongoing regeneration and social cleansing. Dubious because numerous art projects made on regenerating council estates up and down the U.K (including 2008’s Artangel-produced Seizure by Roger Hiorns on Harper Rd, another Southwark Council estate) have not resulted in a saving a single council home but have resulted in lots of concerned hot air, liberal hand wringing, pretentious art criticism and endless academic studies. Southwark Notes has met hundreds of people over the last 5 years with our optimistic willingness to explain our point of view to those who ask to meet us. Yet we would say 99% of those we meet will not give back from their art, writing or researches or put anything into the campaigns that they come and take from. It has been interested to see, after the Pyramid death, other London estates refusing to have art projects foisted upon them (Catherine Yass’s piano dropping art cancelled at the Balfron Tower, Canton St residents saying no to Performance Poplar on their estate). This is one way of assessing the strength and foresight of campaigns around social cleansing when art can be viewed not as a gift to fighting gentrification but suspiciously as a part of the very process of gentrification itself, a topic on which we have written perhaps too much! Probably worth saying again that what we suggest as a good and strategic way of doing our politics in the struggle against regeneration and displacement demands that if we are to accept Art as a category then we must also demand that it is subject to scrutiny and that this scrutiny is used to understand where Art gives power and to who and thus where it takes power and from who. We heard today (16th Nov 2014) that the cancelling of the Pyramid via community campaigns described as a massive act of artistic censorship. With so much written by the campaigns about why they didn’t want the Pyramid artwork, you wonder what it takes to come up with that perspective and exactly what the persons stakes and investments in it are?! Once again, the Pyramid saga rolls on and on. • This will be another one of our local walks round the area looking at different sites, developments and characters around the local ‘regeneration’ of the area. We decided not to go over old ground too much (Strata, Heygate etc) but to focus the walk on the new sites – Shopping Centre, One The Elephant, Artworks Box Park, The Signal Building, Eileen House, Newington Causeway Peabody sites and many many more. In this walk we will ask ‘who benefits?’. With this in mind, we will talk about that very issue – if the local community is not benefiting as promised, which companies and which individuals are benefiting. We will also be looking at how regeneration attempts to place itself on top of people’s local life and history and pretend it was never there. Intended as a community conversation rather than just us lot going on about it all, please bring your stories, experiences, knowledge, gossip etc and share as we walk, stop and talk. 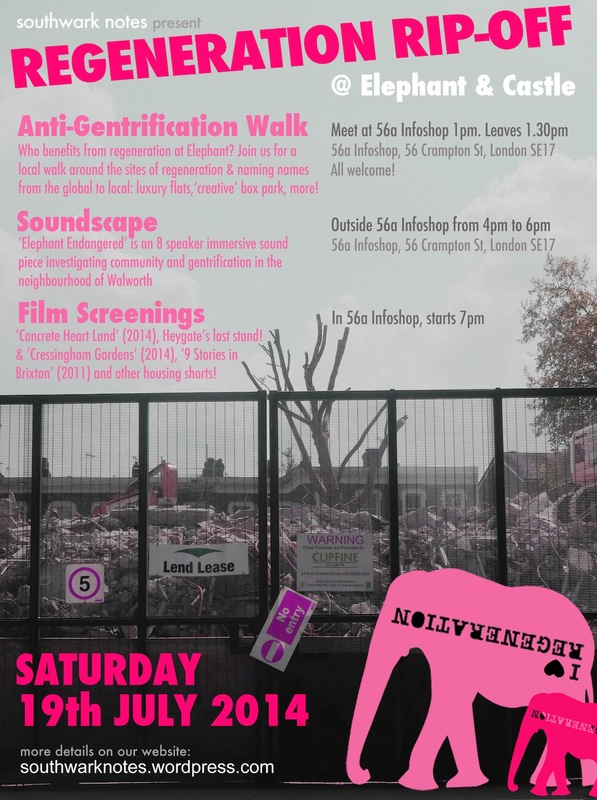 • “Elephant Endangered is a sonic investigation into community and gentrification in the London neighbourhood of Walworth. The area has been subject to several contentious ‘regeneration’ schemes that have already caused the loss of 1100 socially rented homes of the Heygate Estate. Elephant Endangered is made up of the many sounds of the area which are overlaid with conversations had with neighbours, friends, and longstanding residents. The work is set to continue with new sounds and voices being added through continued dialogues, events, and activities in the community”. “Concrete Heart Land exposes the social cleansing of the Heygate Estate in Elephant and Castle, South London. 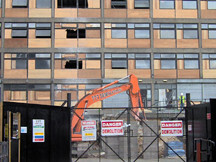 It marks the moment that the estate was finally lost as social housing to make way for an unjust ‘regeneration’ scheme. Assembled from 12 years of archive materials the film charts the struggles of the local community to keep their homes, stay living in the area, and maintain communal benefits in the face of the advance of this now notorious ‘urban redevelopment programme’. Throughout the film we hear the community engaging in some of the crucial battles with elected officials, planners, and barristers in municipal planning meetings, public enquiries, and interviews”. “9 Stories in Brixton is a tale about nine residents who live in and around The Guinness Trust estate in heart of Brixton. Earmarked for redevelopment for a number of years, the landlords are now proposing to demolish the estate and rebuild the blocks nine stories high, thereby increasing the capacity of the estate by 30%. A group of concerned tenants, held meetings to discuss estate issues, and have subsequently endured attempts by the landlords to set up a rival tenants association”. Plus other short films on housing and other topics that take our fancy. If you have any short films pertinent to the night’s screenings, please bring on USB stick! See you there on the 19th! We at Southwark Notes mansions have been really busy working on this booklet and now we can happily announce it’s arrival into the world. We will be working on distributing the printed version to those who need it and also spreading the online PDF version to any and all who might find it helpful in the here and now. Please spread yourselves too via www, Facebook and Twitter and other. This handbook explains why the regeneration of council estates often results in established communities being broken up and moved away, and housing becoming more expensive. It is designed to help local communities learn about gentrification and the alternatives they can fight for. Through the experiences of council tenants, leaseholders and the wider community in London, it contains ideas, stories, tools and resources. 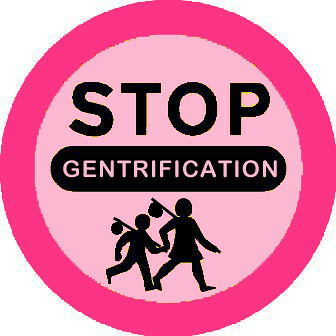 • When is ‘regeneration’ gentrification? 2: What can you do about it? • Finding out what’s going on! Professor Loretta Lees is a London-based urban geographer. She is an international expert on gentrification and the policies and practices associated with it. She is working to persuade policy makers and communities that there are alternatives. 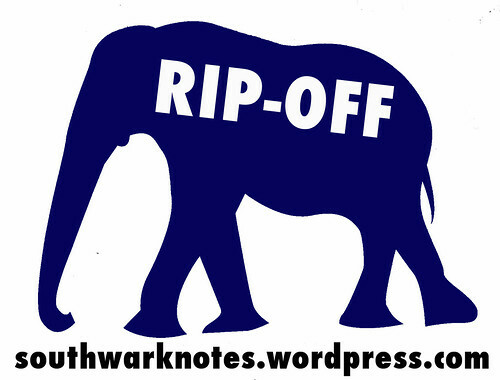 'NAY-SAYERS' since 1999 Southwark Notes Is Not Registered As A Community Interest Company.